To look back on my top five favorite childhood junk foods, you might think that I was an unhealthy child. Nothing could be further than the truth. My mother was - and still is - a stellar cook, and unlike some kids I actually loved (and still love) several fruits and vegetables. But for pure preserved snack food comfort, these are the ones that stand out for me, and I wholeheartedly admit that I occasionally still eat them today. 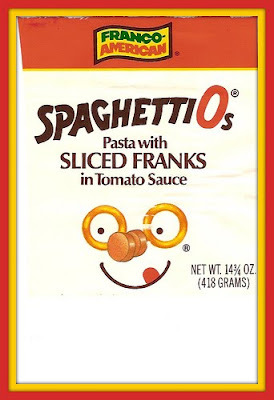 It still baffles my mother as to why I loved SpaghettiOs so much. Even though we had pasta on a regular basis, there was something about the taste of the sauce and those cute little meatballs that made my mouth water. I guess part of the appeal to kids is the various sized pasta "hoops" that ranged from teeny tiny ones to big rings that you could wear on your pinky. Occasionally, I've been known to buy a can and still eat them today. I'm pretty sure that these leathery fruit snacks are responsible for a couple of the fillings in my teeth. I seem to remember them making their debut in supermarkets in the 80s, but the initial ones I was introduced to from schoolmates were no name brands. They came in just about any imaginable flavor (my favorite was apricot; a piquant mix of tanginess and sweetness) and were actually made from real dried fruit (which, as we know, doesn't always qualify something for "health" food.) They were so good I could peel the entire piece off the cellophane, fold it up, and stuff it in my mouth. Today, there's nothing I love more than a good cheese, whole grain crackers, and a nice Riesling. However, such gourmet food items are not always available to you when you're ten years old. I don't even want to think about how much sodium and preservatives I consumed during my early years on these things. Honorable mention: I also loved ANY kind of cheese flavored cracker, such as goldfish and Cheese-Its. You know why I loved these little ice creams portions so much? Because they came with a wooden mini tongue depressor, and they were just enough to satisfy a small stomach (and for adults, they're a perfect serving of sweet tooth satisfaction that won't break your scale.) I still love them today for the retro factor - they were created by Hood in the 1920s. From the 1930s through the 1950s the little lids that you peel off the top were adorned with pictures of sports stars and celebrities. If you own a mint condition Dixie cup lid with Lucille Ball on it from 1952, it's worth hundreds of dollars! How could resist dehydrated, pressed potato chips? I still eat these today. In the 70s I seem to recall them being available only in the original flavor. It wasn't until the 80s that sour cream and onion, BBQ, and other flavors were introduced. 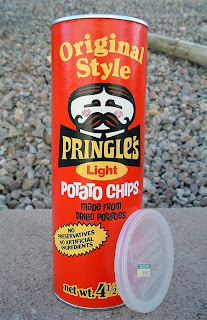 After all these years, I finally discovered what the name of the mustached Pringles mascot: Julius Pringles. I love the 70s style font and graphics of the original packaging, pictured here. Mmmmm...this was a yummy trip down memory lane for me. What were some of your favorite junk foods from your childhood? I loved Hoodsie cups. The perfect portion control. Once in a blue moon, we got fruit roll ups. We never ate anything else on the list. I was the same way with Spaghetti O's! They must sprinkle kiddie crack in those things, because when I tasted them as a teenager, I said, ick, gross. And the horrible little meatballs? But I couldn't get enough when I was 5. I loved the Dixie cups. 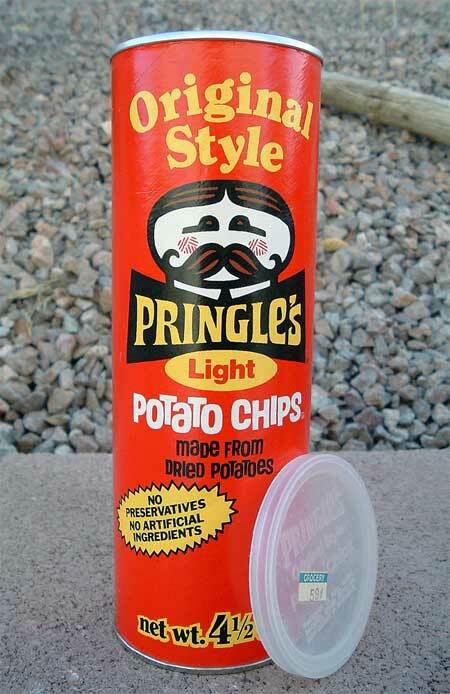 Pringles remind me of trips to Wildwood with our friends in the late 70's -mid 80's. We'd always bring them. I haven't had either of these things since back then. Never heard of Hoodsie cups, but I always loved the individual ice creams. The fruit leathers were so much better in the 80s. They actually tasted like some fruit might have been involved in the process. And I LOVED the cheese and cracker snacks! Do you know they got rid of that red plastic plank to smear the cheese on the crackers? What an atrocity! Now kids (ha, ha, "kids") are supposed to just dip the crackers in the cheese reservoir, like it's the Dark Ages or something. For better wellbeing, we have to avoid eating garbage sustenance however much as could be expected in light of the fact that they accompany such a large number of awful impacts.